Reliable and accurate measurements of temperature and strain in structures subjected to fire can be difficult to obtain using traditional sensing technologies based on electrical signals. Fiber optic sensors, which are based on light signals, solve many of the problems of monitoring structures in high temperature environments; however, they present their own challenges. 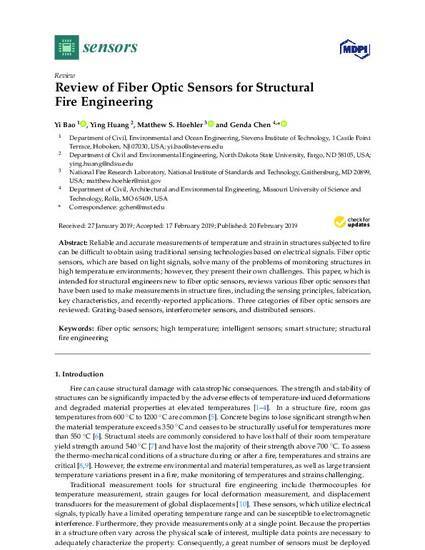 This paper, which is intended for structural engineers new to fiber optic sensors, reviews various fiber optic sensors that have been used to make measurements in structure fires, including the sensing principles, fabrication, key characteristics, and recently-reported applications. Three categories of fiber optic sensors are reviewed: Grating-based sensors, interferometer sensors, and distributed sensors. © 2019 MDPI, All rights reserved.